Tonight, San Diego deathgrind malefactors, CATTLE DECAPITATION, will kick off their North American Extinction headlining tour. Set to initiate in Sacramento, the band’s latest live infiltration will run through nearly two dozen cities, coming to a close in Atlanta on October 7th. Support will be provided by King Parrot, Black Crown Initiate and Dark Sermon. The tour follows the band’s appearance on this year’s Summer Slaughter and serves as a precursor to their run supporting Cannibal Corpse in October as well as a subsequent run of headlining dates with support from label mates Abiotic in November to close out the year. See all confirmed CATTLE DECAPITATION live dates below. CATTLE DECAPITATION continues to tour in support of their chart-topping The Anthropocene Extinction full-length, issued via Metal Blade Records on August 7th. The record more than doubled first week sales over their previous release, Monolith Of Inhumanity, resulting in the #41 position on the Top 200 Current Albums Chart, #5 on the Hard Music Chart, #6 on the Independent Albums Chart, and #14 on the Rock Albums Chart. 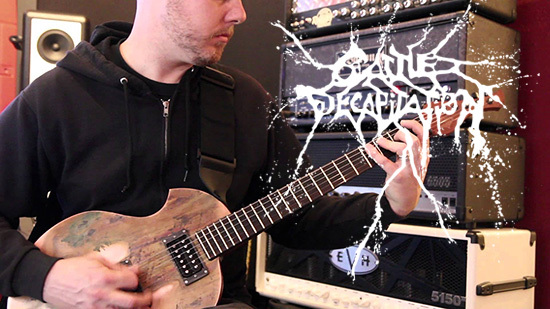 In celebration of today’s tour kick off, the band reveals the official play-through video for “Mammals in Babylon.” Watch guitarist Josh Elmore, drummer Dave McGraw and drummer Derek Engemann remind you that (extreme) practice makes (extreme) perfect at metalblade.com/cattledecapitation. The Anthropocene Extinction is available NOW via Metal Blade Records at: metalblade.com/cattledecapitation.